DARTMOUTH, Mass. – The Southcoast Breast Center, a part of Southcoast Health, was recognized by the American Cancer Society at its annual Making Strides Against Breast Cancer (MSABC) walk this past Sunday in Providence, R.I., for its extraordinary efforts supporting breast cancer patients and caregivers, while also embracing the Society’s mission to help people stay well, get well, find cures and fight back. The recognition was accepted by Dr. Maureen Chung, Medical Director of Southcoast Breast Center. The Society also recognized the Southcoast Breast Center for recently receiving a three-year full accreditation by the National Accreditation Program for Breast Centers, a program administered by the American College of Surgeons. Accreditation by the NAPBC is only given to those centers that have voluntarily committed to provide the highest level of quality breast care and that undergo a rigorous evaluation process and review of their performance. The American Cancer Society partners with many hospitals, and cancer centers across New England, as well as the nation, as a leader in the fight to end breast cancer today in every community, and are working tirelessly to find cures to end the disease tomorrow. 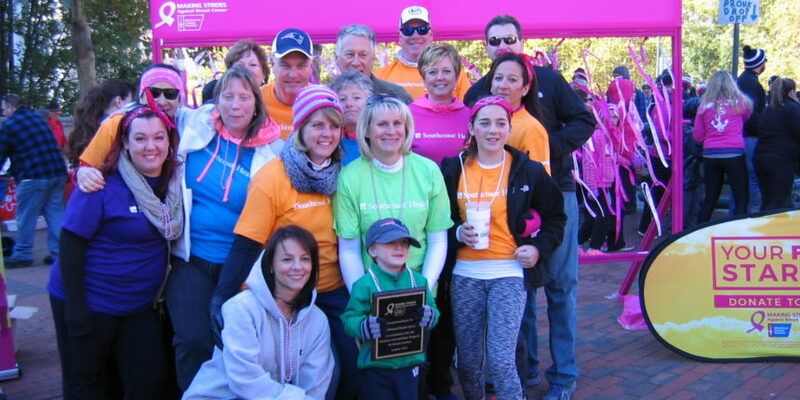 Each year the Society’s MSABC walks are held nationwide to celebrate those who have battled breast cancer. Since 1993 nearly 10 million walkers across the country have raised more than $590 million through the MSABC walks. To learn more about the Southcoast Breast Center, visit www.southcoast.org/breastcenter or call 855-749-3349.